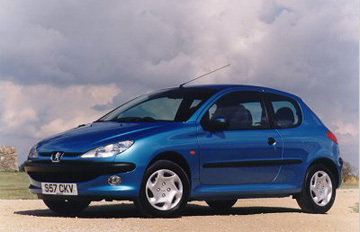 The 206 has ended up being Peugeot’s bestselling car of all time. Yet, it almost didn’t exist. When production of the 205 model ended the French car manufacturer had no intention of replacing it with a similar type of vehicle. However, the supermini market really took off at this point and the firm eventually decided to produce the 206 as a replacement. From the start it was a huge success, with its sleek styling and good handling attracting positive reviews and a lot of buyers. A number of different versions were added over the years it was produced, giving different engine options among other things. However, the looks remained very similar until the very end. Unlike a lot of different cars, the different models of Peugeot 206 you will see up for sale are all very similar to look at. However, don’t let that fool you into thinking that they are all exactly the same underneath the bonnet as well. Models range from those with 1.1 litre engines all the way up to more powerful 2.0 litre versions. The Peugeot 207 is the replacement vehicle for the 206. The Peugeot 206 remains a very good looking car. It looked fresh and youthful when we first saw it on the streets of the UK and time has been kind to it. Some reviewers compare it unfavourable to the model which replaced it (the 207). However, bearing in mind the age and price differences the 206 is still good enough to be considered a smart purchase. Apart from the looks, the main reasons for choosing one of these cars are pretty much the same ones for choosing any of the other top superminis. We will look at the insurance group issue in a minute or two but even without considering that aspect this is a cheap vehicle to run. Low tax costs, good fuel efficiency and a decent level of reliability all mean that you won’t need to spend a fortune on keeping your 206 on the road. Its compact sizing and easy handling also mean that it is ideal for nipping around city centre streets, while it can handle long motorway trips well enough too. The plastics in the interior look a bit dated on some models now but overall it is a car which offers a high level of value for money and even older models don’t usually look too dated. The cheapest model to insure is the 1.1 Independence 3 door, which comes in at a group 5. This isn’t going to get you the cheapest possible insurance quote but it is a low enough group to ensure that you get quoted a reasonably low figure for your car insurance. There are then a number of other 1.1 litre models sitting in the group 7 level. If we move up to group 9 then we can see a lot of different models here, with 1.4 litre and 1.9 litre models heavily represented. There are also a few different versions of the 206 as high as group 11. These include the 1.6 XS models and some 2.0 litre models too. Be sure to check the exact model name of the one you are interested in and get an insurance quote for it.